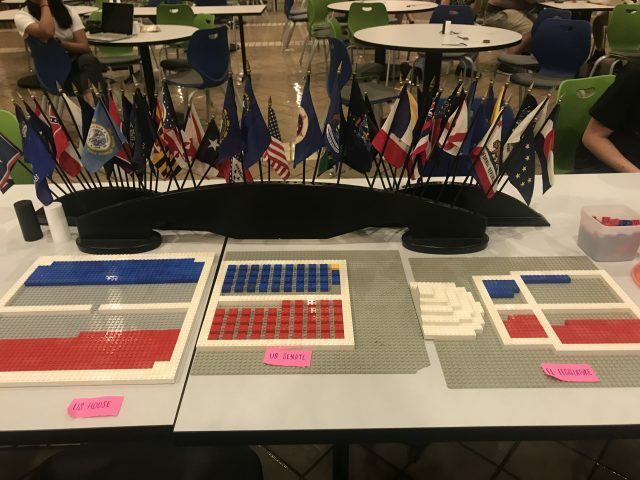 New College Research, Instruction and Data Services Librarian Winn Wasson created interactive Lego replicas of the United States House of Representatives, Senate and the Florida Legislature for display at the Election Night Watch Party in Hamilton “Ham” Center. As the results rolled in, Wasson placed a color-coordinating Lego, blue for Democrat and red for Republican, in each chamber for each seat won. In a historic election night, the Democrats regained control of the House of Representatives for the first time since 2010, while Republicans retained control of the Senate and expanded their majority. With races still to be called in Arizona and Florida, their pre-election majority of 51 seats will range from 52 to 54. Political analysts are left to wonder if the Democrats’ win can be called a rebuttal of the anti-immigrant, racially divisive, fear-mongering rhetoric spouted by President Trump and the GOP, in an election that Trump referred to as a “referendum on me” at a rally in Mississippi. Besides the Democrats tipping control of Congress, the midterm elections made historic strides for women, people of color and LGBTQIA+ candidates. For the first time in history, over 100 women were elected to the House of Representatives. And there were many other firsts during the night. According to the New York Times, “more openly lesbian, gay, bisexual and transgender people were elected Tuesday night than in any previous election,” including Democratic Rep. Jared Polis in Colorado, who will become the first openly gay governor in the United States. According to the Victory Fund, a nonpartisan political action committee (PAC) committed to electing LGBTQIA+ candidates, 154 LGBTQIA+ nominees were elected Tuesday night, with nine at the federal level, 91 at the state level and 54 at the local level. Other history-making winners include: Alexandria Ocasio-Cortez, who is LatinX, 29 years old and will become the youngest woman ever elected to Congress, representing New York’s 14th district, Ilhan Omar, in Minnesota, and Rashida Tlaib, in Michigan, who will become the first Muslim congresswomen to serve in the House and Ayanna Pressley who will become Massachusetts’ first Black congresswoman. Sharice Davids and Deb Haaland will become the first Native American women to serve in the House; Davids, from Kansas, is the state’s first openly LGBTQIA+ congress member. Even after the polls have closed, several races are still undecided, including three Senate races, several House races and the high-profile gubernatorial races in Florida and Georgia, according to NPR. Georgia gubernatorial candidate Stacey Abrams has refused to concede the race against Republican Brian Kemp and filed a federal lawsuit on Sunday asking a judge to delay the counties’ deadline to certify vote totals from Tuesday evening until Wednesday, Nov. 14, and “to make officials count any votes that were wrongly rejected,” according to a Nov. 11 article from the Washington Post. While no official recount has been ordered, Abrams’ campaign leaders contend that 30,823 votes remain to be counted, while Kemp’s campaign argues that less than 18,000 ballots remain. Currently, unofficial returns show Kemp leads with 50.3 percent of the vote. If neither candidate receives a majority of the vote, Georgia law orders that the election must go to a runoff. If Abrams won, she would become the first female Black governor in the history of the United States. According to the Post, Georgia must certify a statewide result by Nov. 20. This is the first full, statewide vote recount in Florida’s history. On Sunday, Nov. 11, the Tampa Bay Times reported that Scott led Nelson by 12,562 votes, a 0.15 percent margin. DeSantis led Gillum by 33,684 votes, a 0.41 percent margin. Fried led Caldwell by 5,326 votes, a 0.07 percent margin. By Thursday, any race with revised totals that remain within or drop below a 0.25 percent margin will have until Nov. 18 to conduct a manual recount. This does not mean every ballot is counted by hand. According to the Tampa Bay Times, “a manual recount means the canvassing boards count each overvote and undervote by hand.” Although these recounts seem hopeful for Democrats, the possibility that Nelson and Gillum “will find themselves on top after a recount seem low, according to veterans of Florida’s presidential recount in 2000,” the New York Times reported on Nov. 10. But at New College, optimism remains for these closely-watched races. Information for this article was gathered from nymag.com, cnn.com, npr.org, nytimes.com, washingtonpost.com, nbcnews.com, cbsnews.com and tampabay.com.